Having successfully emerged from behind the Iron Curtain, this short break is designed to give a taster of everything that makes Moldova unique. Along the way taste Moldovan wine, Kvint brandy and traditional hearty cuisine. Arrive in Chisinau and check-in to the hotel. Chisinau is located in the very heart of Moldova and is the country's capital city. Moldova has a chequered history, which includes the nationalist movement and power struggles of the 1990s, which led to its freedom from the Soviet Union. Most of the city was destroyed during World War II and an earthquake in 1940, so the architecture is mainly in the 1950s striking Soviet style, but there are also two large parks, which give the city a much greener feel. Moldovans are known to be some of the friendliest people in Eastern Europe and nowhere is that more obvious than in Chisinau, where we spend the next two nights. Explore the city's main sights on a walking tour this morning including the Orthodox Cathedral of Christ's Nativity, the exterior facade of the Presidential Palace and the Parliament building and the Holy Gates, which is known as Moldova's 'Arc de Triomphe'. There's the chance to haggle in the local food market and bazaar and join the locals promenading in the park along the Avenue of the Classics of Moldovan Literature, which is lined with statues and busts of Romanian and Moldovan authors and social figures. There's the opportunity to visit the emotive Army Museum in the Centre of Culture and Military History. The exhibits here document Soviet-era repression and the crimes perpetrated by Lenin and Stalin. They tell the story of mass deportation, gulag labour camps, manmade famines and other harrowing tales. This afternoon at the Cricova or Milestii Miei Wine Cellar, discover the extensive cellars and sample their sparkling wine. Moldova is recognised for its good wine and back in the Soviet era the country was known as the 'the vineyard of the USSR'. 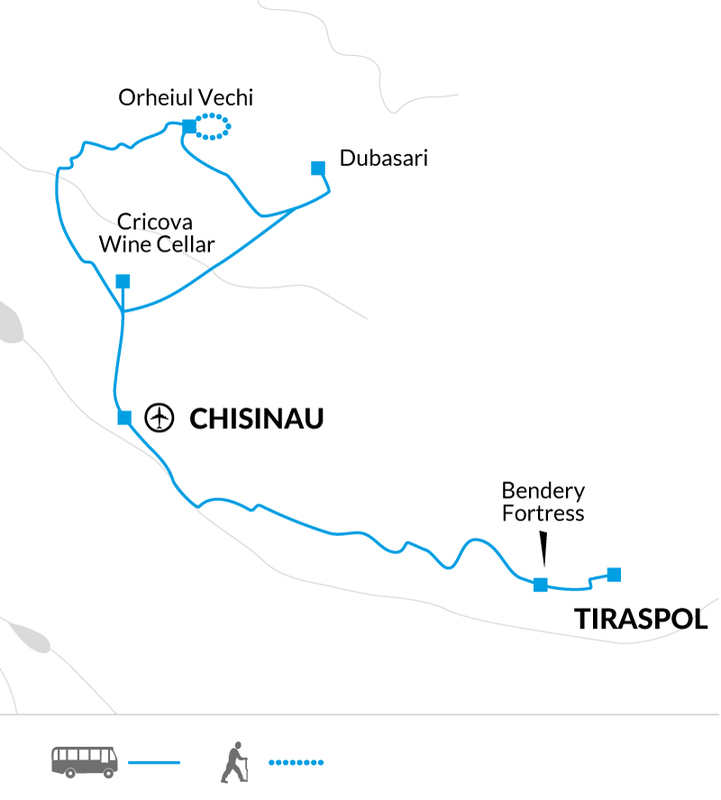 Cricova and or Milestii Miei make use of tunnels constructed in the building of Chisinau in the 15th century. They've been producing wine here since the 1950s and have a number of wines that have won prestigious awards. Returning to Chisinau this evening, dinner will take place in the Carpe Diem Wine Bar to sample traditional Moldovan cuisine coupled with a variety of excellent local wines. Leaving Chisinau this morning the first stop made will be at the 16th century Ottoman fort at Bendery, which is nestled between a former army base and a very impressive bas-relief of the Soviet Worker. Next, cross the border to experience one of the most unique places in Europe - Tiraspol, the capital of the breakaway state of Trans-Dniester. Unlike the rest of Moldova, Trans-Dniester hadn't wanted to separate from the Soviet Union, so back in 1992 after a short conflict they declared their independence. However, it's not recognised by any of the United Nations as an independent state even though it has its own government, military, postal service, currency, flag and national anthem. Once the border formalities are complete we set off on foot to view the numerous war memorials including those commemorating the 1992 Civil War and Trans-Dniester War, and the Supreme Court, Statue of Lenin, De Voln Park and Arch of Bendery. After a little free time for lunch it's time to visit the Kvint Brandy Factory for a tour and tasting. Kvint is considered by the locals to be a national symbol of Trans-Dniester and even appears on one of their banknotes. It was founded in 1897, making it the oldest operating commercial enterprise in the region and as well as brandy the factory produces wine and vodka. After checking in to the hotel, dinner will be taken at the home of a local family where there is the opportunity to ask them questions and learn about their lives in this special hidden part of Europe. Before leaving Tiraspol, head to the Central Market where there is the option to buy a picnic lunch ready for the full day spent in Orheiul Vechi in rural Moldova. The visit to the Orheiul Vechi Complex is undoubtedly one of the highlights of the trip. This site is of great historical and archaeological importance and is home to one of the most unusual church complexes in Eastern Europe. Set in a ruggedly beautiful valley gorge, shaped by the Raut River, there are several ancient monuments amongst and carved into the huge limestone outcrops that date from 10th century BC up to 14th century AD. The Cave Monastery was dug into the cliff by Orthodox monks. Above ground there's a church dedicated to the Ascension of Saint Mary and a museum providing a further insight into the area. We take an Easy graded walk around the site which takes around two to three hours and covers five to six kilometres with a picnic stop along the way. Before returning to Chisinau, enjoy a traditional Moldovan dinner of dishes such as zeama - a tasty chicken soup and mamaliga - a type of polenta with fried meat and fresh seasonal vegetables washed down with homemade wine. During dinner there's the chance to see and join in with traditional folk songs and dancing. Please note that if the weather is too poor to do the walk then a visit will be made to the Curchi Monastery instead. The trip ends after breakfast at the hotel in Chisinau. Entrance to the Army Museum in the Centre of Culture and Military History, operates on day two for around one hour, 40 Moldovan Leu (MDL) per person. July and August are the hottest months and lightweight cotton clothing is best. During spring and autumn temperatures can be lower or drop during the evenings and there is also a stronger possibility of rain, so pack layers. Rainwear may be needed at any time of year. A warm fleece/jacket is recommended for cooler evenings. Take comfortable walking shoes for exploring and trainers or sandals for relaxing. A water bottle, sun glasses, sunscreen and a sun hat are all essential. An umbrella may also be useful at any time of year and gloves, a woolly hat and scarf if you are travelling in autumn. Only small face towels are provided in some hotels, so if you prefer a larger bath towel it is advised that you take your own. Please note that the majority of hotels in the Moldova don't have air-conditioning. The city of Tiraspol has been cut off from tourism for a number of years and so the choice of hotel's here is limited and the facilities and decor are less sophisticated than in other parts of Europe. Moldova: Visas are not required by UK, EU nationalities, Australian, New Zealand, US and Canadian citizens. Other nationalities should consult their local embassy or consular office. If you're short on holiday leave and want to experience somewhere that is only a short flight away but is completely different to other destinations in Europe and is somewhere few people have experienced, then this is the short break for you. Travel off the tourist trail, get a taster of lesser visited Moldova and experience life in a unknown breakaway state. Festival Departures: Join a departure to visit Tiraspol on Victory Day to see the military parade honouring the fallen from World War II or on Independence Day to see the celebrations on the anniversary of this self-declared independent state breaking away from Moldova. Alternatively, on the 5th October visit Chisinau during the Moldova Wine Festival.